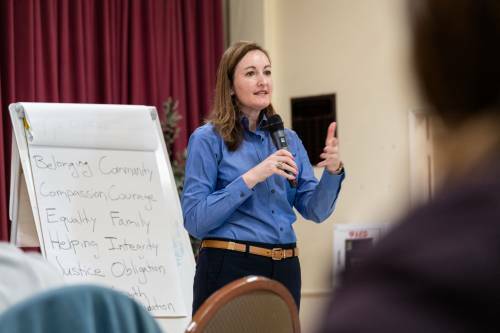 LOUISVILLE — Stewardship is not something we have to do, says Maggie Harmon, Ministry Relations Officer for the Presbyterian Foundation. It’s something we get to do. Exploring the psychology of giving, stewardship and generosity can give pastors, church leaders and nonprofit executives a deeper and richer understanding of how to overcome discomfort in discussing money and how to lead a theologically sound discussion of stewardship, Harmon says. Harmon will be teaching an online seminar Money, the Mind & Ministry in partnership with the Applied Wisdom Institute at San Francisco Theological Seminary. The four-week, eight-session comprehensive course for pastors, church lay leaders involved in stewardship and nonprofit leaders on stewardship and giving begins March 19. You can register at this link. One of the things Harmon says is most important about the course is understanding the psychology of giving and how dealing with money affects both giver and receiver. At a base level, Harmon says people respond to giving for two reasons: it brings pleasure or avoids pain. Unfortunately, she believes the history of giving in the church is related to the latter — the avoidance of suffering or punishment in the afterlife. Giving, she says, was theologically misunderstood for far too long as purchasing a ticket into heaven and out of hell. He says one of the goals of the Applied Wisdom Institute, and the partnership with the Foundation, is to offer a platform to educate pastors and nonprofit leaders in practical management skills often missing from seminary curriculum. Harmon says the ideal candidate for the seminar is someone in their first five years of ministry or leadership at a nonprofit, or those who haven’t yet led a stewardship campaign. Lay leaders who are involved in stewardship within their congregation are welcome as well. “Anyone who, when they see the word stewardship or money and immediately reacts negatively, I want to talk to them as well because we do spend some time thinking about where this discomfort comes from,” she says. While some of the homework throughout the course leads to sermon writing for pastors, she says the projects can be easily translated into planning or writing church newsletters articles about stewardship and incorporating other means of communication. In addition to being prepared to define goals and write narrative budgets, Harmon hopes each participant completes the seminar with the ability to better understand the needs of their community and translate that into a plan to engage other in what it will take — from a time, talent, and treasure aspect — to fulfill that mission. Thompkins echoes this talking point, saying the Applied Wisdom Institute is eager to host this seminar and others like it. Gregg Brekke is a freelance writer, editor, photographer and videographer. He most recently was editor of Presbyterian News Service.